It Does not apply if your domain is managed in our DNS servers. Information necessary only if you will use third-party DNS servers to your domain. Replace “YOUR_DOMAIN.COM” with your own domain name. YOUR_DOMAIN.COM					TXT	"v=spf1 include:spf.freehosting.host ~all"
Choose the resources you need and enter the domain name to use during order process. Our team can assist you in all stages of the migration process, at no cost. Just request it by support ticket. If you prefer to do it yourself, the tools in this process can be used directly by the client. Just click the “Domain admin” menu inside Webmail settings page, and navigate through the tabs. Create all the email accounts in our system. Create the first email account at client area, and set it as mail administrator. Later you can define other administrators. Once the administrator is created, one must log in through webmail and use the batch creation and import tools. Importing existing messages from the old provider to ours. Visit the Configuring Email Client page. * Domain migration is the last step, and will enable the receipt of email messages on our servers. * Make sure you have performed all the above steps before domain migration. If you’re going to use website and email in our system, just set up your domain to use our DNS Servers. Look at the bottom of Configuring Email Client page, at subtitle “CONFIGURING AN EXTERNAL DNS SERVER”. 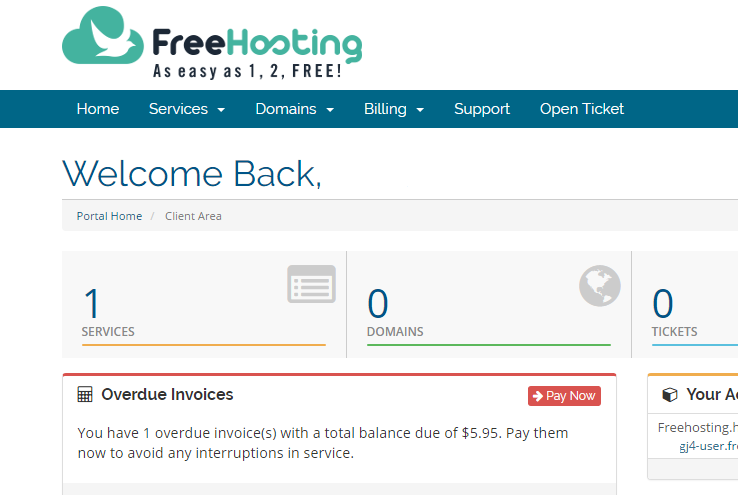 If you prefer to use the option (Website and email at FreeHosting.host) and add to our DNS some other configuration to external websites or services, simply send us the DNS records you want to create. Before configure your domain to use our DNS servers, you need to add it to them. Below the screens of each step. 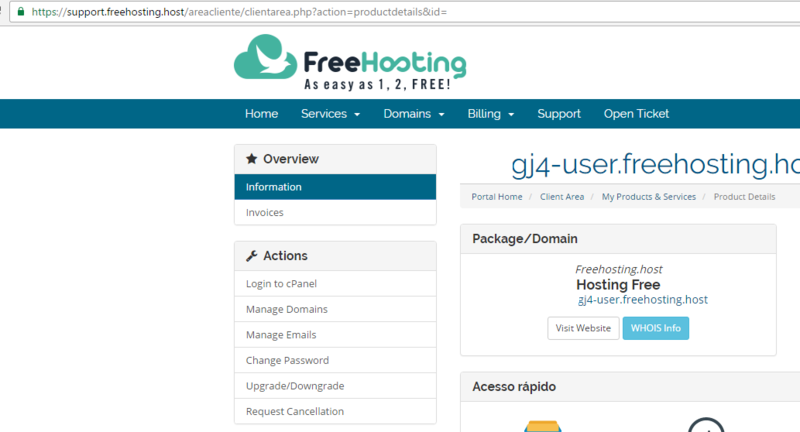 Login at client area to gain access to your hosting configuration. Click at services box at the top box on your dashboard, to list your active services. Select desired service clicking on it. Click at left menu item “Manage Domains” to continue. Now, click at blue button “+” to add all needed domains. Save when finished, so all DNS entries will be created at our DNS servers. If you already inserted a domain at your client area, you are able to create email accounts. Services >> My services >> click over the hosting service (or email service). Once you have your first mailbox created, set it as “Email Admin” and sign in Webmail with this account. Inside Webmail, go to Settings >> @Domain Admin . Here you have many friendly tools to create/edit mailboxes, batch create, import messages from other providers, statistics, Aliases, Blind Carbon Copy, and others options. Explore all options and configure what you want. Also inside Webmail Settings, you can configure redirects, auto-responder, additional accounts, and spam settings. Log into webmail and once logged, click at the top right corner link ‘Settings’. At left menu, click on ‘Antispam’. You will see some blue buttons with question mark icons, click and it will display contextual tips. These emails were received and retained after content analysis. May be spam and fraudulent messages contain viruses. Here we list the emails received in the last seven days, which had its contents evaluated by the filters and were blocked by strong indication of spam. “View” button sends the locked to your Inbox email, so you have the opportunity to evaluate its contents, if desired. These emails were rejected prior to content analysis based on sender reputation. You can not view its contents, unlike the quarantine tab because the message was not received. Here we list the emails whose delivery was refused in the past three days, based on data from the sender, strong indication of spam. So new messages from this sender, from the same IP range which originated this email will be automatically accepted by anti-spam system. When you click “Not Spam” or “Allow”, is automatically inserted here a record containing remittance information, and similar submissions will be accepted by the spam filter. The “Delete” button removes the permission, so that new emails sent will no longer apply this rule. When you click “Spam”, is automatically inserted here a record with remittance information, and similar items shall be rejected by spam filter. The “Delete” button removes the restriction, so that new emails sent will no longer apply this rule. Here you can create rules manually and inform the emails of the senders that can be Allowed (accepted) or Prohibited (rejected) by our spam filter. These are simple rules, which evaluate only the sender of the message. The sender of an email can be easily forged, so we suggest the use of Spam buttons and Not Spam in the message list, or the Allow button in Emails blocked. These buttons create more smart rules, evaluating other data message and the sending servers. jonhdoe?? @hotmail.com -> blocks jonhdoe01@hotmail.com, jonhdoe20@ hotmail.com, jonhdoexx@hotmail.com, etc. The easiest method to access your E-mails is using the Webmail. In the login screen, at to top-right screen, you can change your language, if desired. Now log into webmail with your full email address and password you choose when creating the email account. The easiest method to access your emails is using the Webmail. You can also access using your own domain at URLs, but the webmail access will have no encryption, it is not recommended.